All of our Safety Glasses are Impact Resistant. All of our safety glasses come in designated lens colors. Every dozen will arrive in a custom designed free display box. Each pair of safety glasses is wrapped in a poly bag before being placed in the display box to ensure that they stay in perfect condition. Click here for more information on our custom designed display boxes. We now have a nice variety of protective eyewear. 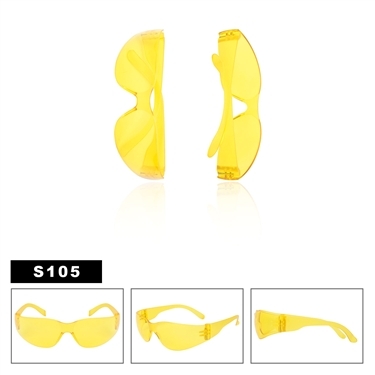 Click here to see more of our wholesale safety glasses yellow, clear or tinted.